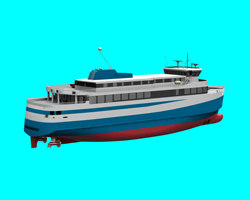 A new ferry designed to provide a lifeline, domestic service to the Vestmannaeyjar, or Westman Islands, in the extremely challenging conditions off the southwest coast of Iceland, has been ordered from a Polish yard for delivery in June 2018, writes David Tinsley. Laid out for a maximum 540 passengers and some 70 cars, and featuring an overall length of 69.38m, a moulded breadth of 5.1m and a design draught of 2.8m, the 315dwt vessel is under construction at the Gdansk premises of Crist Shipyard, to the account of the Icelandic Road & Coastal Administration. Early design evaluations, entailing CFD calculations, model tests and full-scale bridge simulations, were carried out in Denmark by FORCE Technology. These addressed the operator’s requirements for the ferry’s year-round deployment between Vestmannaeyjar and the mainland terminal at Landeyjahöfn, a route subject to very rough conditions caused by the large swell fetching all the way from the South Atlantic and bouncing off the sheer Icelandic coast. A strong, transversal current at the entry to Landeyjahöfn harbour, combined with the mixture of long ocean waves and shorter coastal waves, places particular demands on manoeuvrability and seakeeping. The water depth at the approach is only 4.5m, yet the ferry will be capable of operating in waves up to 3.5m. Besides its regular run, the vessel will be suitable for occasional use on longer voyages to other ports. While embodying Polarkonsult’s PK-259.1 conceptual design, detailed and production design is the responsibility of StoGda Ship Design & Engineering, a partner of Crist Shipyard. The new Icelandic ferry will be powered by a diesel-electric power plant, augmented by an 800kWh battery pack, making for a hybrid system offering a short-term total output of 4,800kW. A pair of pulling-type azimuth main thrusters, each rated 1,700kW, promises a service speed of 13 knots. Reflecting the pressing need for manoeuvrability, two 600kW tunnel thrusters will be fitted in the foreship. The ship will be certified to carry 540 passengers during the summer months. In winter, the maximum will be 390, due to the prohibition of passengers from the outdoor terrace deck areas in the harsh winter conditions. Sometimes referred to as Iceland’s Pompeii, the Vestmannaeyjar archipelago comprises multiple islands and skerries, and inhabitants number around 5,000. Most live on the largest island, Heimaey, which suffered a volcanic eruption in 1973, destroying much of the housing and leading to its complete, temporary evacuation.